You could be forgiven for thinking any female singer dressed in retro garb and carrying a copy of the satanic bible has a chance of joining a band these days. Switzerland's Pulver hope to disprove that theory. Husband and wife team, Inga Pulver (vocals) and V.O. 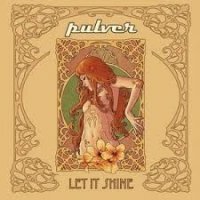 Pulver (guitar), have retained the dark vibe but include a more Metallic tone in their vocal approach, which may just set them apart from the competition. Things take off at an elephant's pace guitar wise and the band nails their intentions firmly to the mast. At first, the vocals seem oddly out of place among the sludgy dirge coming from the guitars, but take the time and the song eventually goes up a gear, offering some rewarding stuff. 'When My Time Comes' chugs along like a barge of the dead, with guitars spitting out lead breaks and the almost spoken lyrics sounding like a drone. The approach of 'Racing Queen' leans towards a more Metal like delivery and the faster pace of the song pushes things along nicely. Continuing the harder approach, 'Bring It On' is a slow burner with a no-nonsense chorus and the big fat riffs of 'Let It Shine' are slapped on the table waited to be devoured, in a style similar to that of Black Label Society. The golden nugget for me is 'Trains A-Rollin'. Standing head and shoulders above previous efforts, the riff sounds achingly familiar and the chorus has distinctive Southern flavour. With only a guitar and voice, 'Ocean' finds its place amongst the mayhem, with its beauty coming from its minimalist approach.